Unless you're new here or live under a rock, you know that I live in Wrigleyville. If you've been up here, you know that we have bars, a few other bars and a couple more bars down the street. But thanks to some new developments, we now have actual restaurants! 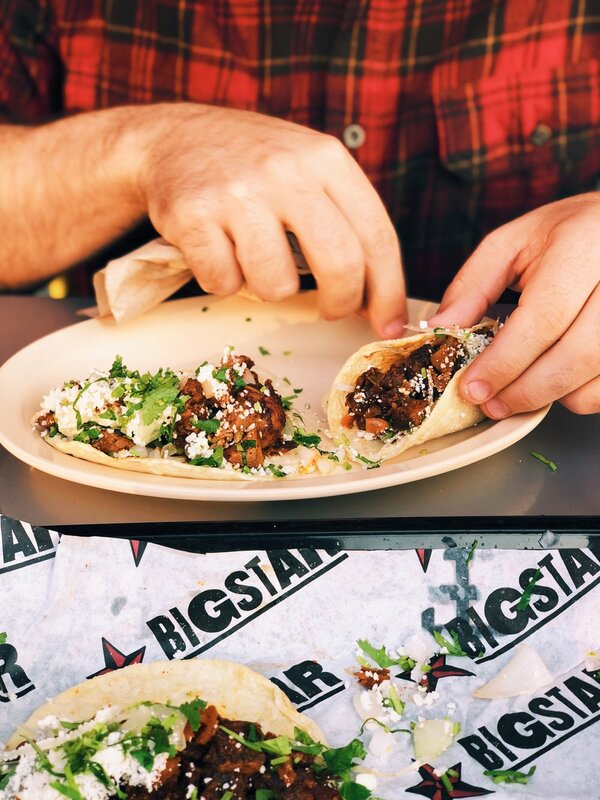 So we stopped over by the new Big Star because who doesn't love a good taco? KM celebrating an accepted offer over tacos & beer. We enjoyed the outdoor patio on a chilly day which wasn't too bad since the patio is heated. We ordered some tacos & beer and enjoyed the sunny day. On game days, you can watch the Cubs on the screen at Gallagher Way while enjoying your meal or just enjoy chatting with your company. We ordered the Taco de Pescado, Taco de Papas con Rajas & the Taco de Panza. Located at 3640 N Clark St, Chicago, IL 60613 in Chicago's Wrigleyville neighborhood. The original Big Star is located at 1531 N Damen Ave, Chicago, IL 60622 in Chicago's Wicker Park neighborhood.